A Creative Project Organized by African Urbanism + No Limits Charity Organization, in collaboration with Teresa Meka Photography and Chanelle Nicole Frazier. This youth photography workshop and exhibition was a creative project to engage youth in Ga Mashie in creative arts, by engaging youth in their own community. The activity was part of a concerted effort to develop children’s creative expression through photographic imagery, to encourage them to share their views, perspectives and insights in an open, safe and welcoming space. The three-day photography skills workshop series was a skills building workshop focused on camera photography, including the mechanics of the camera photography, choosing subjects, and framing. Each workshop session included an introduction and training to photography techniques and principles for each child, followed by a two-hour community exploration and photography, and finally a one-hour recap session during which each child presented his/her photos and received feedback from the group. African Urbanism and No Limit Charity Organization, with support from curator Chanelle Nicole Frazier, exhibited the children’s work in their local community in Jamestown on Saturday, January 14, 2017 at Jamestown Café. The photographs included in the exhibition were selected by the youth themselves. At the exhibition, each child presented his/her work to the audience and shared his/her story, motivations in photography and insights from the photographs she/he captured. To provide youth with a skills building opportunity to learn the creative art of photography and to develop their creative and intellectual self-expression through images and words. To provide a platform for youth from Ga Mashie to find and use their voice, creativity and expression through photography. To highlight their creative potential as artists, and to share their unique perspective on the community in which they live and play. This workshop series and exhibition built off a previous youth photography workshop conducted in October 2015, in which No Limits Charity and African Urbanism brought in professional photographer Des Clark to work with 12 boys and girls from Ga Mashie. Over the course of a Saturday afternoon, the children learned how to operate a camera and its functions, went out in groups to take individual photos, then re-grouped in a session in which each child shared his/her photos and the stories of the subjects they captured and gained feedback. This initial session tapped into the youth’s enthusiasm and desire to learn art, and it demonstrated the capability and skills of these youth to capture compelling and thought-provoking photographs of their everyday environment. 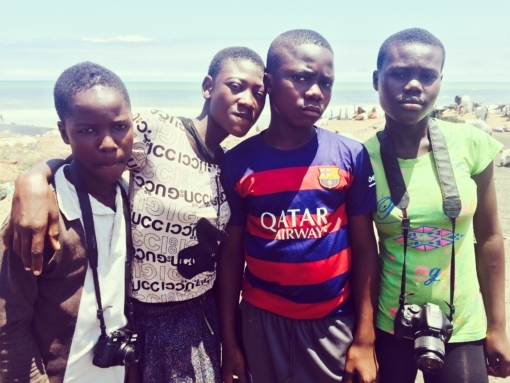 What’s more, this photographic exercise was a starting point for these youth to interact with their subjects and their community – their neighbors, playmates and community elders – in an entirely new way. The youth not only documented images; they captured the stories of these subjects, and then reflected on these stories and their role as storytellers, empowering them as creative agents with voice in their community, and to share their experience of their community. What does the community of Ga Mashie look like from a child’s unique perspective? What aspects of everyday community and social life stand out for our children? How can their insights re-frame the way we see community? How can youth use photography as a tool for their own creative expression? Using photography, what messages can youth share with the world? No Limit Charity Foundation, a Ghanaian NGO, and African Urbanism, an online and offline platform for engaging citizens on urban development, both bring to this project strong experience working in Ga Mashie and engaging youth in skill building and creative expression geared toward community improvements. Both have regularly volunteered and worked with children in a range of activities, including: organizing children’s artistic and play spaces, youth cultural processions, designing and building child-friendly street furniture, and planning and developing a pop-up children’s park. In addition, No Limit supports youth development, education and critical needs. African Urbanism is currently conducting research on access to safe public spaces in the city of Accra, and engaged students at Happy Days Academy to inform perspectives in the Jamestown community.